Fanfare reviews copyright © 2015 by Fanfare, Inc. Used by permission. This is certainly not the first time someone had the bright idea—the genuinely bright idea—of combining the Everest of cello concertos with the amiable foothill that inspired it. After composing his early A-Major Concerto in 1865—a work he didn’t even get to orchestrate before the cellist absconded with the manuscript—Dvořák became persuaded that because of its screechy upper register and murky lower range the cello was not a proper solo instrument. Then, during his tenure as the director of Jeannette M. Thurber’s quixotic National Conservatory of Music in New York, he heard a fellow faculty member play his E-Minor Concerto and abruptly changed his mind. While the Second of Victor Herbert’s two cello concertos is no real companion piece for the Dvořák—but then again, with the possible exception of the Elgar, what cello concerto is?—it’s a well-made, handsomely scored late-Romantic confection in which the future composer of Naughty Marietta and Babes in Toyland frequently works his soon-to-be famous melodic charm. From the measured way the Korean conductor Djong Victorin Yu begins the Dvořák it might seem that this is going to be a rather long slog, but things brighten considerably at the famous horn solo and even more so at the soloist’s emphatic entrance. A student of Leonard Rose and Pablo Casals, a medalist at the 1974 Tchaikovsky Competition in Moscow, James Kreger’s recordings have been mysteriously few and far between, given how masterfully he plays the instrument. This is easily one of the most carefully nuanced of the concerto’s recent recordings, with no detail of the score’s dynamic indications escaping the cellist’s eye. His partner proves to be equally sensitive to the subtlest shadings, without ever shortchanging the music’s dramatic thrust or missing its overall design. If not quite as individual as Alisa Weilerstein’s recent outing with Jiří Bělohlávek and the Czech Philharmonic (Decca 478·5705 or, better still, on Decca 478·6757 as part of that new benchmark cycle of the complete symphonies and concertos), then Kreger offers a dignified, intensely musical interpretation in the grand tradition, supported by typically thrilling playing from the Philharmonia and first rate recorded sound. Competition in the Herbert is understandably less ferocious, but here, too, Kreger and company are more than a match for fine versions from Yo-Yo Ma, Gautier Capuçon, and Lynn Harrell, whose classic Decca recording with Neville Marriner and the Academy (417 672) also offers—perhaps more sensibly—the composer’s early D-Major Concerto in what is currently the only viable recording of this instantly appealing, incomprehensibly neglected piece. Kreger’s playing is again exemplary, as is his obvious delight in a piece whose fun factor is extraordinarily high. A predictably sensitive version of Klid—usually, if imaginatively, translated as “Silent Woods”—rounds out a generous and rewarding disc. If you’re the sort of person who likes to ingest new CDs at a single gulp, then you might want to reprogram the rather strange order of pieces as offered on the album. Begin with the Herbert (tracks 5–7), follow with the Dvořák (2–4), then tack on Klid (1) as an encore. This not only preserves the historic progression of the two concertos, but also spares the Herbert from sounding like a complete anticlimax. In a world of recorded music rife with duplication, it is hardly surprising that James Kreger and the programming staff at Guild were not the only persons who thought to couple Dvořák’s masterpiece with the beautiful work by Herbert—which, legend has it, inspired the visiting composer to write for the instrument. In the U.S., the 1995 coupling featuring Ma, Masur, and the New York Philharmonic is probably best known, and there is a 2009 Erato pairing that features Gautier Capuçon with Paavo Järvi (recorded in Frankfurt—Herbert would have been pleased). I don’t know that one, but am familiar with the other major recordings of the Herbert (Harrell/Marriner, Webber/Mackerras, Miquelle/Hanson—the first LP recording of the Second Concerto). I have no hesitation in stating my preference for this Guild recording, originally issued in 2002. It is one of the most arresting recorded performances in Kreger’s discography. It is a notable statement by soloist, conductor, and orchestra of a beautiful score. Cellist and conductor open with great vigor, and a sense of address. How a South Korean conductor developed such a feel for the idiom I don’t know, but the years spent at University of Pennsylvania (he studied with Crumb and Rochberg among others) could not have hurt. Kreger plays as to the manor (and manner) born, with breadth and passion, and in the lento section, with surpassing tenderness. The cellist’s intonation is, as usual with him, rock-solid; his rich sound is tonally beautiful. I find the recorded sound entirely satisfactory. The Herbert is somewhat more lightly textured than the Dvořák. In both works balance of the solo instrument to the orchestral tutti is exceptionally well managed. The soloist is well positioned and the microphones, positioned in Croydon’s Fairfield Halls auditorium (a fine recording venue) have captured the balance splendidly. The CD opens with Dvořák’s Klid (Silent Woods) in a performance which I know is one of the soloist’s favorites among his recorded output. I share his opinion. He does not permit the work to lapse into sentimentality, and at 6:45 duration, neither does he dawdle. No one will disagree with me if I venture that his playing here is the equal of any cellist who has recorded the piece. I am not sure I would have placed this work first—I might have opened with the Herbert (as Dvořák’s inspiration). But no one asked me! What of the great Bohemian composer’s Concerto? Again, we have a recorded performance to stand comparison with any. I am far past making detailed comparisons of recordings of this great piece (one of which I never tire). Readers are entitled to know which recordings I hear on a regular basis: Starker/Dorati/Mercury, Feuermann/Barzin/Philips, Schiff/Davis/Philips, Cook/Edelstein/Accademia dell’Arte (which Jerry Dubins and I reviewed in 38:4), and this CD. Where to place this one? James Kreger has told me (I paraphrase) that, if Don Quixote is the most intellectually and musically profound work in the repertory for cello and orchestra, the Dvořák op. 104 is the work which brings out the most of the cellist’s soul, personality, and character. That is just how he plays this work. It is a recorded performance notable for warmth and sensitivity and deep expression. Not as fiery as Starker, and without Feuermann’s almost superhuman sweep, it has plenty of drama and vigor, and also in each movement a sense that soloist and conductor know just where they are going. Schiff is notable for awesome reserve and most reviewers don’t like that (combined with Colin Davis’s stiff upper lip). That is far from James Kreger’s way. He shares with Kim Cook an obvious affection for the music and enthusiasm for playing it here and now (at time of recording). Cook benefits from the unique tone and tang of a Czech orchestra, but here the Philharmonia also amazes. At time of this recording the Philharmonia had several years experience working with Djong Victorin Yu, and just as the conductor provides great “push” from the podium in the Herbert, so here he and the orchestra sound as one. British orchestras have made superior recordings of both these concertos (the LSO with Starker and the RPO with Rostropovich in the Dvořák, the LSO and the ASMF in the Herbert), and I find the Philharmonia’s work here totally of a piece with the soloist’s efforts and Dvořák’s requirements. The solo “licks” by leader Hugh Bean in the third movement are particularly flavorsome. If asked to compare Kreger’s playing to a historical recording, I would go back to the early Decca one by Nelsova with Krips and the London Symphony. There is no lack of drama, but warmth, sensitivity, and, when needed, a sense of repose. Kreger’s second movement would melt the proverbial stone. As Jim Svejda noted in a companion review, this Dvořák is a touching and entirely satisfactory performance. Coupled with a ravishingly beautiful Klid and a memorable traversal of the Herbert Second, this is a disc to be heard by all. The three pieces on this release are serendipitously interrelated; they belong to the period of 1892–95 when both Antonín Dvořák and Victor Herbert were in New York and had access to each other’s work. In those years Dvořák was serving as head of the National Conservatory of Music, while Herbert was assistant conductor of the New York Philharmonic under Anton Seidl and was also busy composing and appearing as a cello soloist. Herbert’s work, composed in 1893, may have been inspired by Dvořák’s New World Symphony, which received its premiere at the New York Philharmonic in December of 1893; Herbert chose the same key to set his work, which received its premiere under Seidl, with the composer as soloist, in March 1894. Herbert’s success may, in turn, have spurred Dvořák to write his master cello work, so impressed was he by the way Herbert could make the instrument sing expressively. In addition in 1893, Dvořák made a version for cello and orchestra of Klid, which he had composed prior to coming to America. Thus, the historical and probable artistic interconnectedness of these three cello compositions make for a very interesting and cohesive disc. James Kreger gives the works a thoughtful, highly refined musical interpretation. There is nothing flashy about his approach; rather it is restrained, introspective, almost meditative, and technically impressive. His cello sings lyrically in the high register pianissimos of the Dvořák Concerto, and elsewhere supplies a soulful, yearning melancholy. Djong Victorin Yu conducts the Philharmonia Orchestra with a keen sense of Romantic line, yet always with tasteful phrasing. Klid is played with a rapt, dreamy, hushed character that beautifully evokes the silence of the original title, Waldesruhe. Dvořák’s Cello Concerto in B Minor is one of the sublime works of that repertory, and Kreger, Yu, and the ensemble give it the majesty it merits. The Allegro first movement is brooding and ominously hints of tragedy; the bucolic second, Adagio ma non troppo, is given a quiet, melancholy reading; while the Allegro moderato finale pulsates with exquisitely contained emotion. Kreger’s delicate handling of the ornaments and his heart-wrenching playing of Dvořák’s allusion to the melody of his deceased sister-in-law’s favorite song, Lasst mich allein, is powerful music-making, indeed! While Herbert’s Concerto No. 2 for Cello and Orchestra in E Minor may not have the same stature as Dvořák’s cello masterpiece, it is nevertheless an accomplished and appealing work by a composer who is known today primarily for his operettas. The Concerto uses the same Romantic idiom as Dvořák does, but it is a more extroverted piece which—not surprisingly, since Herbert performed it himself—calls attention to the virtuosity and technical acumen of the soloist. Nonetheless, the second movement, Lento – Andante tranquillo, is genuinely moving in its tender, dark melancholy, and Herbert confidently orchestrates the entire Concerto to envelop the cantabile of the cello. Both Kreger and Yu accommodate the differences in nuance and style between the works with ease. The sound on the studio recording is rounded, warm, mellow, and sensitive to all the cello’s subtleties, though occasionally the orchestra seems a little covered. The accompanying booklet contains excellent liner notes by Benjamin Folkman in English, German, and French, as well as artist biographies. Highly recommended for the insights these performances offer into two unusually paired composers, as well as for Kreger’s interpretation of these benchmarks of the cello repertoire. The Concerto for Cello and Orchestra by Antonín Dvořák is not only the greatest concerto for its solo instrument, but one of the greatest concertos for any instrument. In the era of the compact disc, the more modest concerto by Victor Herbert makes a historically and aesthetically satisfying companion, having been composed and performed by Herbert when he and Dvořák were friends and colleagues in New York City. The Dvořák, averaging around 40 minutes in performance, offers memorable melodies, ingenious scoring, an unconventional but effective formal scheme, and an extended, heart-rending coda unlike anything else in the literature. From its opening orchestral tutti in B Minor to its final dying melody in the cello, it alternately suggests a profound tragedy or flies into rapturous songs-without-words. There is a grand solo part, yet much of the time the cello is one of several equal voices, engaged in exquisite duets with clarinet, oboe, or violin. Victor Herbert's Concerto in E Minor, is altogether more modest. Yet, within its more limited scope—22 to 24 minutes—it has not merely charm but its own sort of perfection. Herbert was an expert cellist, composer, and conductor before achieving fame and fortune in musical theater. His concerto is not only written gracefully for the instrument, but beautifully scored for the orchestra as well. Its graceful melodies develop, evolve, and combine to provide a musical argument worthy of the greatest masters. In any sort of decent performance the piece is a joy to hear, except, of course, for those grouchy people who think any classical music with a tune you can hum is beneath their notice. Recording this Dvořák Concerto, which has been recorded by virtually all the great cellists of the 20th century—Feuermann, Casals, Cassado, Rose, Tortelier, Fournier, Rostropovich, Du Pre, Schiff, and Ma, among others, come to mind—is quite a challenge. The veteran American cellist James Kreger meets it handsomely. His highly disciplined cello playing is uniformly rich in sound, pure in intonation, and convincing in phrasing. The Korean conductor Djong Victorin Yu leads the celebrated Philharmonia Orchestra of London in a luxurious-sounding accompaniment in perfect accord with the soloist's interpretation. The sound is of the rich, resonant kind, suggesting a full-sized symphony orchestra in a large hall. There have been far fewer recordings of Victor Herbert's Concerto, though those who play it seem to relish the experience. My first—and excellent—recording of it may still be available in a Mercury CD reissue: Georges Miquelle, with Howard Hanson and the Eastman-Rochester Symphony. But Yo-Yo Ma, Kurt Masur, and the New York Philharmonic provide the head-on competition for Kreger, Yu, and the Philharmonia, having coupled the Dvořák and Herbert Cello Concertos on a Sony CD: SK67 173. Which is better? Kreger's Guild release adds the lovely filler, 'Silent Woods', and the finer notes (though Sony's are excellent). Both have great sound, but of quite different types: The Sony is close-in, allowing those who appreciate hearing each inner voice distinctly the opportunity to do so. Guild's sound is richer, fuller, and smoother. Guild also has the wider dynamic range: the orchestral fortissimos' are awesome. Ma and Masur are of course totally at home with the music, and play it with skill and zest. Kreger and Yu are perhaps a tad more measured—more classical if you will—in their approach, though both recordings capture the essences of the two concertos very well. Happily, I now own them both, and need not choose. Guild deserves high marks for programming. Other record companies have coupled the Dvořák with Tchaikovsky's Rococo Variations, Elgar's concerto, or (rather inappropriately) Shostakovich's First. Guild gives us the rare treat of also hearing the work that was Dvořák's inspiration. And, although confusingly identified by its Czech name, Klid, on the jewel box, the familiar Silent Woods could be fairly called one of Dvořák's practice exercises for his masterpiece (along with the early cello concerto from 1865). When Dvořák arrived in New York in the fall of 1892 to take over his post as director of the National Conservatory, the newly-founded institution's cello instructor, Victor Herbert, was one of its star faculty members. Herbert was born in Ireland, raised in England and Germany, and musically educated in the latter country. He had already made a name for himself as a cello soloist and had settled in New York in 1886, when he and his opera-singer wife joined the Metropolitan Opera Company. Herbert was about to embark on his career as an operetta composer, but despite his cosmopolitan background, he shared a Central European musical foundation with Dvořák. The album notes tell us that Herbert was inspired by Dvořák's New World Symphony not only to write his Cello Concerto 2 but to echo the older master in some of its rhetorical and stylistic gestures. The concerto is in E minor, same key as the New World, but it strikes me as owing its greatest stylistic debt to Schumann's concerto — three movements without pause, a similar 22-minute length, and even a similar busy-ness (sometimes denseness) of orchestration. Benjamin Folkman, Guild's annotator, sensibly resists hype and is honest enough to admit that it's a well-crafted, competent work, but hardly on the same inspired plane as Dvořák's. Nevertheless, we have an example of a lesser composer drawing inspiration from a great one and, in turn, inspiring his mentor. Herbert's concerto was premiered on 9 March 1894 by the New York Philharmonic under Anton Seidl, with the composer as soloist. It opens grandly and dramatically with a brief orchestral exclamation, followed by an impassioned cello flourish before we launch into the non-stop flow of the intense first movement. II is a gentle, somewhat pallid song, followed by a finale that veers toward the Herbert of operetta fame. Dvořák, who (Folkman reports) had considered the cello unsuited to the solo role in a full-length concerto, was so impressed by Herbert's score (and perhaps his playing as well) that he had a change of heart and set about writing his own concerto. His work became a cornerstone of the repertory; Herbert's fell into obscurity and has been performed and recorded but rarely. Mr. Kreger brings to all three works a broad, rich, singing yet focused tone that embodies just about everything you could ask for in this repertoire. He knows where the music should go, and he transports us there in a most enjoyable ride on the swells of his glorious tone. He's not in a hurry, but he doesn't let the solo line meander or become disjointed either. With so much beautiful solo work to savor, haste is hardly an attractive prospect. He gives the Dvořák a broad, lyrical, long-lined performance, but bravura passages sizzle off his bow with assurance and panache. There is still much to enjoy in Guild's offering. I recommend it to anybody who wants to become acquainted with a mature, rarely heard late-romantic concerto and a Dvořák with gorgeous solo work. Victor Herbert (1859–1924) — best known and loved for his Babes in Toyland, Naughty Marietta and other attractive operas — was at heart a virtuoso cellist. His Cello Concerto in E minor is a worthy contribution to the Romantic repertoire for his instrument: beautifully orchestrated and boasting good ideas (if without the unforgettable melodies and sheer genius of the Dvořák). In a way, Herbert's duality mirrors that of the renowned and beloved Fritz Kreisler whose violinistic wizardry likewise co-existed with his own Apple Blossoms. Herbert's Cello Concerto received its world premiere in New York at precisely the time (March 9th and 10th, 1894) that Dvořák was serving as director of Jeanette Thurber's National Conservatory. Moreover, the great Czech composer was in the audience to hear his younger colleague's new work (Anton Seidl led the New York Philharmonic); he was sufficiently impressed and motivated to pick up the gauntlet. The juxtaposition of Dvořák with Herbert is an inspired one. Collectors who have been enjoying Yo-Yo Ma's readings for several years should note that the newly released Guild disc actually pre-dates the Sony by a couple of years. The American virtuoso James Kreger — like Ma, a Leonard Rose pupil — plays as beautifully as his more famous counterpart, but presumably was left in limbo until his recording could find an outlet for public release. Comparison with Ma is by no means to Kreger's disadvantage. The latter, whose chamber music playing has always touched me, draws a lithe sound from his instrument, rejoicing in a long, sinewy, singing line. His bowing is creamy smooth, his intonation squarely on target, and his phrasing unfailingly lyrical and intelligent. The Allegro of the first movement of the Dvořák Cello concerto might strike some as a trifle leisurely and laidback, but Yu and his Philharmonia Orchestra nevertheless project a convincing pulse and create a convincing interpretative alternative to the more conventionally paced framework favoured by Ma and Masur. And so it goes with the balance of the Dvořák and the Herbert: the Ma/Masur treatments are perhaps slightly bigger, tougher and more dynamic, but both approaches are superb and musically satisfying. The Guild recording, as luminously reproduced as the Sony, also offers a lovely account of 'Silent Woods' as a bonus. Kreger's and Yu's heartfelt performance compares favourably with one of my particular favourites, the exquisite 1989 CBC account by the Canadian Shauna Rolston, made with the Edmonton Symphony Orchestra under Uri Mayer, when she was barely 20 years old. Rolston is a mite more closely miked and, as a result, seems a trifle more opulent and sonorous (and the Edmonton Symphony's horn section could rival the excellent Philharmonia's and any other world-class orchestra's horns). Rolston's work is coupled with Oscar Morawetz's Memorial to Martin Luther King, Bruch's Kol Nidrei, Fauré's Elégie, and Bliss's Cello Concerto. Victor Herbert's appealing, expertly written concerto probably inspired Dvořák to write his masterpiece in the form. The two works have shared a disc before, splendidly played by Yo-Yo Ma. The new CD has a bonus: Silent Woods, originally a piano duet, then a cello and piano piece, and heard here in the beautiful orchestral arrangement that Dvořák made in 1893. The dark, velvety sonority of the opening is particularly evocative..
James Kreger, mastersinger of the cello, has a glorious new GUILD compact disc recording of the music of Antonín Dvořák and Victor Herbert. The greatest of romantic cello scores is the Opus 104 Concerto for Cello and Orchestra in B minor by Antonín Dvořák (1841-1904). Kreger's striking new recording is preceded on the splendid new CD by one of the Czech master's most exquisite meditative gems, "Klid," Silent Woods. The Dvořák pieces are coupled with the beautiful Opus 30 Second Concerto for Cello and Orchestra in E minor by the popular Irish/American cellist/composer, Victor Herbert (1859-1924). James Kreger's luminous performances are greatly enhanced by the rich support of London's Philharmonia Orchestra led by Korean-born, American-trained composer/conductor Djong Victorin Yu. The songful, expressive quality of the Kreger sound and musicianship are heard instantly in the opening measures of the Dvořák "Silent Woods," and they continue to shine — balanced by brilliant virtuosity — in both of the grand concerti. Folkman is a tad condescending concerning the Herbert concerto, stating that "Herbert's adroitness is on a far lower artistic plane than Dvořák's mastery," describing the work as "a period piece of undeniable charm." Since nothing in the cello repertory surpasses the glorious Dvořák concerto, it isn't possible to make any dramatic claims for the Herbert, but, especially in the big, expressive lyrical and inspired performance by Kreger, Maestro Yu and the Philharmonia, the most popular American work for the cello shines with vibrant excitement. The new GUILD recording displays the artistry of James Kreger in a handsome showcase rich in the player's admired songful expressivity, and adds new dimensions to his list of outstanding accomplishments. 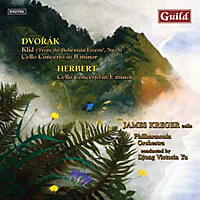 Larger record shops should have the GUILD Kreger/Dvořák-Herbert CD in stock. It is more than worth tracing down. Hours of great listening pleasure are assured. Although the latest recording from the cellist James Kreger includes a fine, soulful performance of Dvořák's Cello Concerto in B Minor—probably the best-known such work in the repertory—it also contains a genuine rarity, Victor Herbert's Cello Concerto No. 2 in E Minor. Herbert is remembered mostly for his operettas ("Naughty Marietta," "The Red Mill" and especially "Babes in Toyland"), but he was also a celebrated cellist, and he wrote well and idiomatically for the instrument. The album is available on the Guild label—a name that might have pleased Herbert, who was a fiercely articulate advocate of copyright protection for composers and a founding member of his own "guild," the redoubtable American Society of Composers, Authors and Publishers. This rendition of Dvořák's Cello Concerto and the miniature "Waldesruhe" is a praiseworthy addition to an already impressive list of identical recorded couplings. The slow basic tempos testify to an interpretive concept whose power stems from a wealth of exquisite detail that never descends to the episodic. Technically the performance cannot be faulted, although the soloist's gestures lack flamboyance. Despite this, there is an arresting beauty in his subtle gradation of phrases and delicately executed ritardandi. Kreger's tone is powerful and warm, with a palette of dark colors exceptionally well suited to the introverted spirit of the Dvořák pieces. It was Victor Herbert (1859–1924) who, with his Second Cello Concerto (premiered 1894), presumably prompted Dvořák to produce his Opus 104. Herbert structured this comical, energetic but stylistically inconsistent work—whose thematic substance curiously combines circus-music with an anticipation of the horror-film idiom—as had his predecessors Schumann (Op. 129), Volkmann (Op. 33) and Saint-Saëns (Op. 33), combining three movements in one. Kreger is even more perfectly attuned to this work's special qualities than in the Dvořák. An outstanding recording technique captures the scrupulous orchestral reading with surprising clarity of detail (for example, the brasses in the slow movement of Opus 104). The CD comes with detailed booklet notes. The late-romantic repertory for cello, starting with Robert Schumann's concerto, suddenly brought to light the great expressive potentialities of an instrument that, until then — but for rare exceptions — had always been given supporting roles, often called upon to show its own virtuosic capabilities, but only rarely assigned a really "important" role. However, it would be too simplistic to explain the strongly lyrical and visceral spirit of the two Dvořák works performed on this most beautiful Guild CD with a mere mention of the composer's "Slavic soul" and his nostalgia for his far-away homeland (the Concerto was composed in February 1895, slightly more than two months before Dvořák left New York, to which he would never return). Indeed, the ample expressive palette of these scores encompasses some of the most important poetic elements of late Romanticism, which would find their ideal fulfillment and most effective synthesis in the works of Johannes Brahms. Although the discographic catalogue scarcely suffers any dearth of superbly authoritative alternatives in this repertory, the interpretation of James Kreger, an American cellist with a distinct personality, ranks at the very top, revealing an artist on whom we must keep a close eye. The most immediately striking characteristic of his style is his extraordinary musical feeling, a spontaneous quality that justifies daring comparison with the most illustrious soloists. Under his knowledgeable fingers, Klid's deep longing becomes pure poetry with a subtle but profound melancholy that reflects the existential torment of the artist and the diffuse restlessness of an entire people. On the other hand, the two concertos by Dvořák and Victor Herbert reveal the magical sound of Kreger's cello, an expression perhaps abused in too many disc reviews but that I believe faithfully reflects the musical universe of this American soloist. Soft and vigorous, round and tenuous, affirmative and mournful, Kreger's instrument provides us with a fascinating, indeed irresistible experience, accompanied by a Philharmonia Orchestra skillfully prompted to top form by its excellent conductor, Djong Victorin Yu. After Kreger's superb CD dedicated to Mendelssohn, this record is another extraordinary triumph. Highly recommended. Technical comments: detailed and very up-front recording. Especially attractive is the definition of the cello's mid-bass register, which further aids in giving full value to the soloist's truly great performance.